Full Disclosure Notice: I have known Cameron McNary since high school, where he was one year behind me. We lost touch when I went off to college and reconnected on Facebook a few years ago. Cam talked on Facebook about the play he wrote, “Of Dice and Men”, and I have made small contributions to his staging of the play at PAX Prime and to the making of this film. However, my friendship with Cam and my contributions have no effect on how or what I write. I’m only saying all this in the interest of transparency. I actually probably judge the work more harshly than if I didn’t know Cam at all – and had I not known him, it’s unlikely I would’ve planned to do a review, since I can’t make it to any of the official screenings. There. The DISCLOSURE is now over. On with the rest of the show. 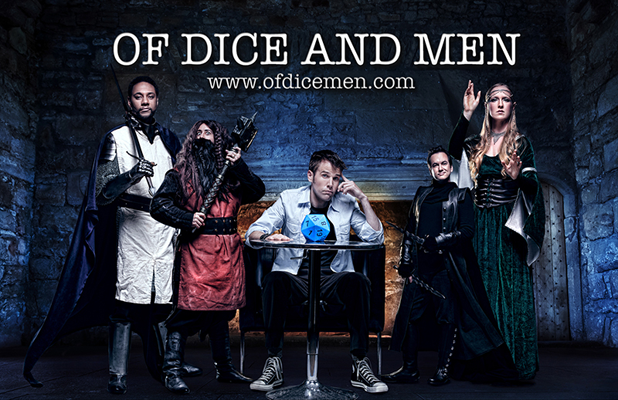 “Of Dice and Men” is a cheeky and sweet look at what happens when a group of friends who game together are impacted by choices made by two of the trio at the center of the group. Based on a play of the same name which debuted in a staging at the PAX Prime convention in 2010, “Of Dice and Men” focuses primarily on two characters: the sweet, sensitive John Francis (Evan Casey), and his foul-mouthed, oafish BFF, John Alex (Cameron McNary). The rest of the gang is comprised of: Jason (Ricardo Frederick Evans), John Francis and John Alex’s close childhood friend; Tara (Gwen Grastorf), the lovely and sweet would-be object of John Francis’ affection; and the married couple of Linda (Rebecca Herron) and Brandon (“One Tree Hill”‘s Greg Thompson) – a hysterically funny, hyper-sexed couple that plays together and stays together. The movie opens with John Alex discovering John Francis packing for a move to Berkeley, and your first taste of their friendship is riddled with John Alex’s f-bombs and gesticulations. Clearly he is the “Jay” to John Francis’ (nearly) “Silent Bob”. 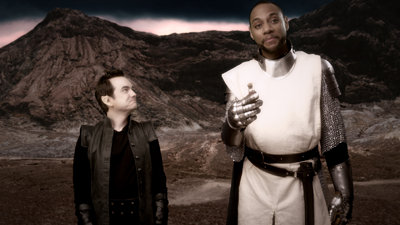 The next few scenes fill in the backstory, including introductions to the group’s game characters – a halfling, a half-elf wizard, a dwarf, a barbarian, and a cleric. To a certain extent, those who’ve never gamed before, particularly with Dungeons and Dragons, will find themselves lost in the minutiae of the gaming characters’ presentation. 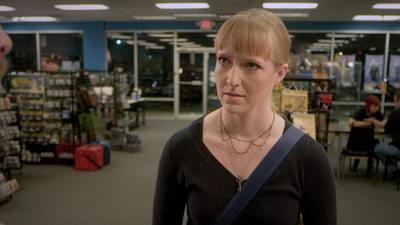 The concepts of “hit points” and “rolling for damage” haven’t yet made it to a broad pop culture lexicon, but the unrequited love between John Francis and Tara is easy to understand. In many ways, a brief scene showing all the missed connections between the two is instantly relatable. The majority of interaction takes place at Linda and Brandon’s dining room table – where miniature figures, graph paper, pencils, and scads of dice cover the tabletop. It is here that you see the game characters reflecting parts of each person’s real personality, such as Linda’s randy Scottish dwarf (who will regale you with tales of genital girth and length for days) or Tara’s wispy wizard who dies at the drop of a hat. Brandon, who games only because of his love for his wife, makes a choppy, hesitant barbarian – yet he is, in real life, clearly a thoughtful and strong person. One night’s gaming results in a fracture when Jason announces that he enlisted in the Marines and is headed for Iraq. John Alex is visibly hurt and lashes out at Jason, and this confrontation makes for a jarring end mid-way through the gaming session. John Francis withholds his own announcement until the following day, dealing with the personal aftermath individually – as friends one-by-one come to his rented room to find him partially packed for a move he’d planned for weeks but never said was coming. The play was inspired by McNary’s best friend shipping off to Iraq around the same time that he was getting married and establishing himself as a real grown-up, so it’s clear that the angst of John Francis and the anger of John Alex represent very real feelings McNary surely experienced. The movie ponders the question of whether gaming has any purpose or meaning, and though it largely leaves that open to interpretation by the individual, it makes a strong case for it – or any hobby or interest – as having value to those who participate in it. The relationships built between those led through the worlds created by Game Master John Francis all love him, and love each other, and the bonds between them are renewed each time they come together around the table with their dice and miniature pewter selves. The movie is a study of characters with characters, and so it operates on several levels. It screens like a play (which makes sense, given its source material), so there are times where scenes fade to black almost abruptly. On the other hand, several nice touches – such as the graph paper background for the credits and the fantasy world backgrounds for character intros – are clever nods to the geek culture that continues to thrive and sustain gaming. I would recommend making it to a viewing, if attending one of the several conventions screening the movie (see below). It’s unclear whether the movie will make it out of the con circuit, and it’s also equally unclear to me that it would resonate with a broader audience where gaming might not be as widespread. Still, it’s a sweet indie film and it was clearly made with love of friendship and of gameplay. What more would anyone need to prove whether gaming matters? “Of Dice and Men” will next be screened at Gen Con 2014 on August 15, 2014, Intervention Con on August 23, 2014, Dragon*Con 2014 (screening date/time TBD, sometime between August 29 – September 1, 2014), and PAX Prime on August 31, 2014. 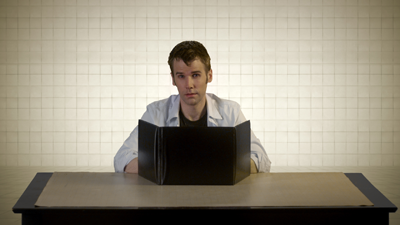 More information about screenings can be found at the official “Of Dice and Men” website. “Of Dice and Men” is currently rated PG-13; it contains frequent use of profanity and one scene with mild violence. This entry was posted in movie reviews and tagged dragon*con, gen con, movie review, ODAM, of dice and men by crunchymetromom. Bookmark the permalink.